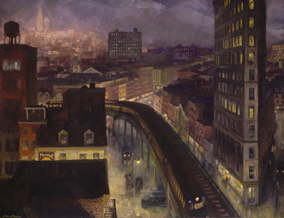 John Sloan’s most iconic paintings are of the city at night. Mastering the darker tones of the spectrum—sooty browns, dusty grays and ashen blacks—Sloan depicted urban denizens of the night in all their glamour and disgrace. In the nineteen-teens, with fellow artists in a group called The Eight, and later the Ashcan School, Sloan juggled xenophobia with voyeurism, and found beauty in filth and filth in the beautiful—all garnered by the pleasures of looking. In the city, there are so many opportunities to fill one’s eyes with the textures of life. Seemingly at once one can enjoy the gushing hordes on a parade route, and step out of the stream of strangers to steal a pause on a rooftop. In Sloan’s hand a busy café is called “Hell Hole,” and snow is pictured in all its color variants, but hardly ever pure white. The exhibit moves beyond Sloan’s early, dark years. A second gallery finds Sloan vamping his pictures with unrestricted colors as if flying the flag of Impressionism. But like Hopper, Sloan revels in his pasty oil paints, so if the subject matter is barren, then wads of paint stand in for visual pleasure. A wet night, though, or a dust storm, are Sloan’s signature atmospheres, where light bulbs don’t glow but are dead weight suspended by the night air.